When colleague and videographer Patrick Butler first mentioned going to Vietnam to follow a group of Irish and American musicians playing music to highlight the ongoing legacy of the Agent Orange tragedy in Vietnam, I wondered if there was a story in it. But I needn’t have worried. Patrick had met the main instigator behind this story and TV documentary the year before when he’d filmed with Mick Moloney in Thailand, again as part of a humanitarian journey to help homeless children. Mick – to those of us of a certain age – is one of the founding members of that great folk group The Johnstons; he’d become an anti-war campaigner as well as an academic in New York when he left Ireland for the States in the late 60s. Behind the scenes, he’s been working consistently to highlight the impact of the war ever since, and using music in a creative way to do it. Mick Moloney first travelled to Vietnam after the war with Peter Yarrow, of Peter Paul and Mary fame (yes, again, those of us of a certain age…. ), legendary folk singers in the vein of Woody Guthrie and Pete Seeger. Peter Yarrow was a public face in the anti-Vietnam War movement, and he was different in that he travelled to Vietnam from early on after the war to see for himself and highlight the tragedies of the legacy of the Agent Orange chemical, a highly toxic chemical the US Army used to raze the jungles and destroy the hideouts of their enemy. Mick and Peter met through music, and continued their friendship to help the Vietnamese. The war ended in the 1970s, but the legacy has continued – in two main ways: deformed children are still being born in the former DMZ, or demilitarized zone in the centre of Vietnam, many being cared for in institutions and by families with few resources. The toxic Agent Orange chemical lives on through damaged genes; children are born without limbs,with intellectual disability, and spines seem to be particularly prone. Secondly, the heavily-bombed DMZ is still being cleared of unexploded ordnance – rubber plantations are now growing over the former bomb-pocked landscape. We filmed with the MAG group, which receives funding from Irish Aid amongst others, and saw them in action. Mick Moloney has returned year after year with a group of musicians to bring music and dance to centres where the disabled children are being cared for; this has a two-fold impact as it brings music to the children and enables the concerts to be televised on state television. On this trip, Irish Aid funded and hosted a number of major music events which enabled Mick and his colleagues – Louise and Michelle Mulcahy, dancer and musician Niall O’Leary, American –born fiddler Dylan Foley, and poet and writer Vincent Woods – to bring the music and poetry of Ireland to a Vietnamese audience, but also to play together with Vietnamese musicians on stage before large audiences. 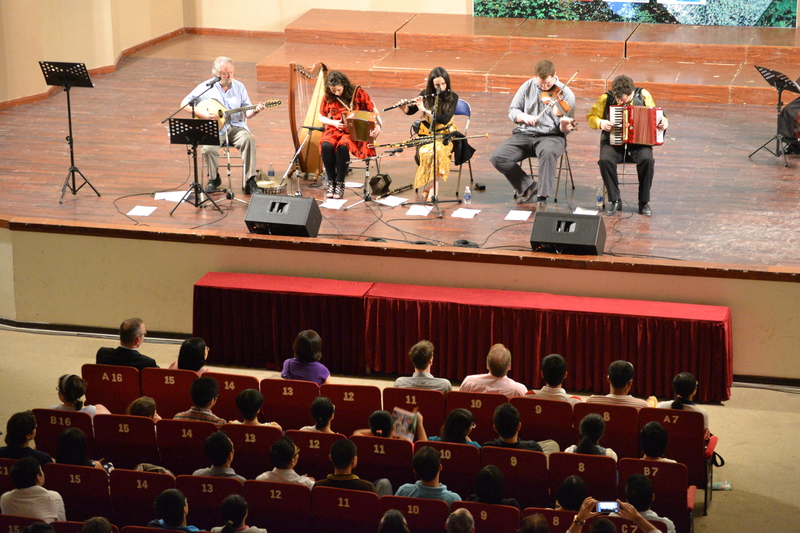 Beautiful music was created, and wonderful synergies when the Irish and Vietnamese musicians played each others’ traditional tunes at the Conservatory of Music in Ho Chi Minh city. “The Green Fields of Vietnam” produced by Aileen O’Meara, with videographer Patrick Butler, airs tonight on RTE One TV at 11.50pm. The documentary was funded by the Simon Cumbers Media Fund.